Roper Rhodes collection of concealed all-in-one shower systems offer a luxurious showering experience combined with good looks. The Factor Concealed Dual Function Shower System features an automatic shut down if the cold water pressure should suddenly fail and is limescale resistant. 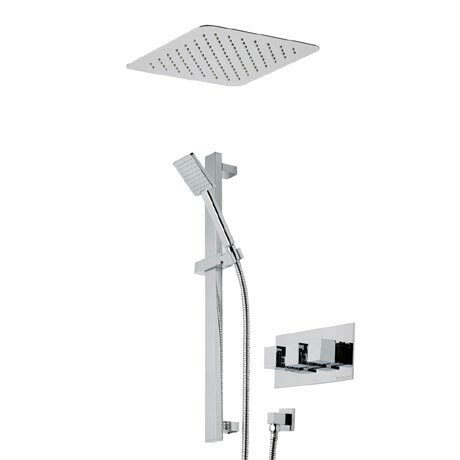 The package consists of a dual function thermostatic valve, 300mm stainless steel ceiling mounted shower head, a rectangular brass riser rail, Air-drive single function shower handset and an easy clean PVC shower hose & brass wall elbow. Air-drive handsets are water saving creating an aerated bubble spray that uses less water. Suitable for all plumbing systems with a minimum pressure of 1.0 bar and above.